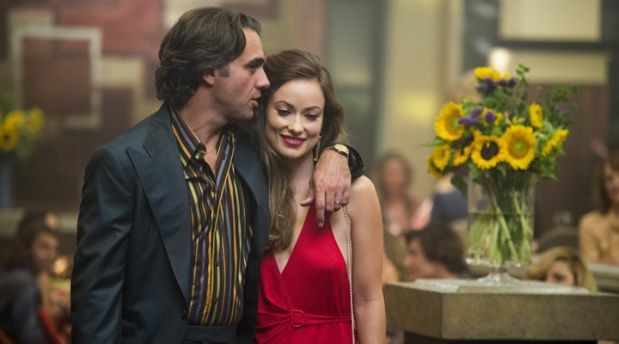 Bobby Cannavale and Olivia Wilde in Vinyl on HBO. If there is one huge difference between being a film critic and reviewing network and cable television it's about time and commitment. After two hours, I can quickly dismiss something like the dramatically inept and politically naive Trumbo, which treats the Hollywood blacklist – yet again – in an apolitical style that turns the story into an easy-to-digest morality tale between innocent idealists and HUAC, while shrewdly ignoring how Stalinist policies actually infected and divided the American left. It wouldn't have been quite so easy to write it off had it been a TV mini-series. I would have had to give it more time. You can usually tell after a half-hour whether a film will hold together, come to life, or turn turtle. But it's not so easy with a television series. A television series – unlike a movie – can continually test your commitment because it has to sustain its story over viewer ratings which can change rapidly over its run. A good show can inherit an audience looking for something new. Friday Night Lights in 2006 brought a fresh look to a small conservative Texas town and its high school football team without patronizing their parochial values. But when the show began its second season, it took an inexplicable turn towards the kind of crude melodrama that scores more with the mass TV audience. All that move accomplished, though, was to violate its own virtues and the good faith of the audience it drew. Luckily, the show quickly came back to its senses – even getting better – but it did lose some viewers who (perhaps feeling betrayed) decided not to come back. Often television shows start out visionary as J.J. Abrams' Alias did in 2001 – where the spy action thriller not only provided visceral thrills, but also contained a fragile and ambiguous emotional core that drew connections between the deceptive loyalties to company policy and how those same deceptions can also run in the family. In its second season, Alias decided to completely detonate its premise and dramatically alter the show's dynamics. Unfortunately, those risks were short-lived as Alias quickly returned to its original plot, which came across a second time as hollow and formulaic, and they began pandering to the audience it once cultivated. Gillian Anderson and David Duchovny in the recently aired tenth season of The X-Files. There is always a danger when good shows draw a cult audience and then refuse to challenge it. That was never a problem for Joss Whedon in Buffy the Vampire Slayer (1997-2003) who continued to pull the rug out from under our expectations for six of its seven seasons. But it is an issue for a show like The X-Files which came back this year in a limited six-episode run after running nine seasons on Fox between 1993 and 2002. In its first years, The X-Files entertainingly played off of our fascination with the paranormal and combining with that a post-Sixties ennui over government conspiracies and cover-ups. Featuring two FBI agents, Fox Mulder (David Duchovny), who was a marginalized true believer in the unexplained, and Dana Scully (Gillian Anderson), a skeptical forensic scientist who came to embrace rather than debunk his work, The X-Files was both playful and devious in its depiction of the unacknowledged 'truth.' Besides some clever writing by creator Chris Carter and his team, the casting was often remarkably right. As the leads, David Duchovny and Gillian Anderson, playing polar opposites, very quickly developed a unity of soul between them that created an appetizing empathy. Although it has now been years since Mulder and Scully faced each other (in the final two seasons of The X-Files, two new agents were featured as the lead characters), the air becomes immediately charged with expectation. In episode one ("My Struggle"), when the camera catches the soft melancholy of Gillian Anderson's face as she enters a hospital operating room as one of its surgeons, you're affectionately drawn back into the show's bottomless enigma. Anderson's Scully has now become more softly despairing since having given up her and Mulder's child for adoption, as well as the unresolved, nagging cases that made up their work. Duchovny's Mulder is emotionally rudderless until he sets eyes on Scully and their first meeting is a pip. 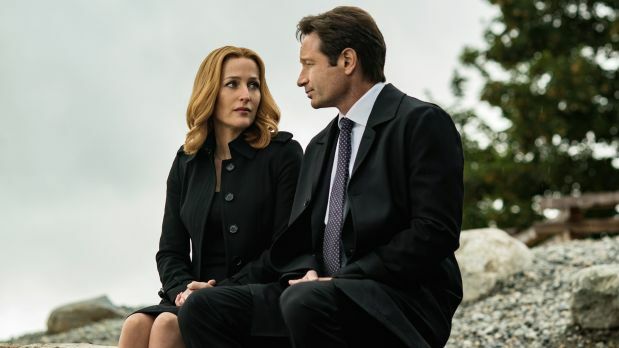 I wish I could say that the new conspiracies awaiting them lived up to the raised hopes, but The X-Files reboot doesn't take its cue from the febrile chemistry of its actors. Chris Carter has created a shapeless mess where the conspiracies are no more intelligent than the ravings of 9/11 Truthers. He seems to have gone tone deaf as well, sometimes mixing parody and tragedy in incomprehensible ways where (as in "Babylon") he opens with a horrific terrorist suicide bombing and then later features the goofy comedy of a drug-induced Mulder dancing in a Texas bar to Billy Ray Cyrus' "Achy Breaky Heart." The X-Files gets caught between trying to find a present tense and pandering to the nostalgia of fans eager to reconnect and fails to find its feet. 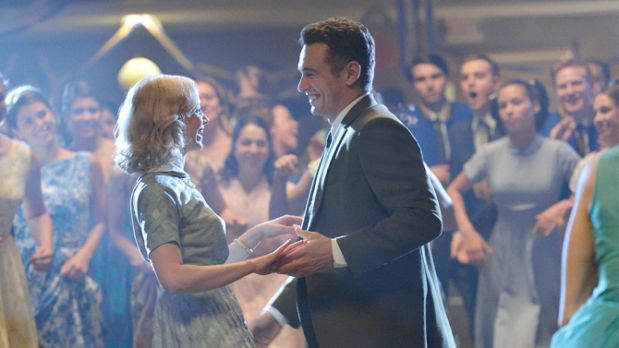 Sarah Gadon and James Franco in Hulu's 11.22.63. When I heard that director Jonathan Demme and author Stephen King were working on a feature adaptation of his thrilling 2011 novel, 11/22/63, about a young high school teacher who goes back through time to prevent the assassination of John F. Kennedy, I was eagerly anticipating the collaboration. Sadly, their partnership and the project came to a dead-end and it's now been turned by J.J. Abrams and King into an eight-part mini-series on Hulu with highly mixed results. While the narrative thrust of the novel is still compelling (even with some small alterations to the story), 11.22.63 lacks a director's shape of the artist's vision. Despite the capable work of James Franco as the protagonist, the dramatic underpinnings seem to be missing. It's as if Abrams and adapter Bridget Carpenter were content to just let the plot carry us forward rather than get at the obsessions driving those who wish to change history by going back in time. 11.22.63. does a nice job of recreating the details of early Sixties America (although shot in both Toronto and Texas) without fetishizing it, but it doesn't spook us with its differences from today. What it does instead is provide obvious and comparative civics lessons on racism, like having Franco stand up to a racist gas station attendant who won't serve a black customer. King's novel is driven by an ache to come to terms with how history sometimes cheats us and he creates a fantasy where we can instead cheat history. But that undercurrent is missing in the mini-series, as if the creators were merely content to tell a story without providing the key component of why we should care. There have been huge expectations surrounding the Martin Scorsese/Mick Jagger/Terrence Winter collaboration of the HBO series, Vinyl, which examines the pop music industry in the Seventies. But rather than being a sharp appraisal of that world, filled with drugs, mobsters, hungry artists and desperate executives, Vinyl compounds all the same problems that sunk The Wolf of Wall Street. If Winter's Boardwalk Empire drowned in its art direction, Vinyl is all excess and grandiloquence as if the record industry was all about snorting the best nose candy. Like Scorsese's The Wolf of Wall Street, where we had no idea of how Jordan Belfort scammed folks or kept the loyalty of his staff, Vinyl doesn't give us a clue as to how Richie Finestra (Bobby Cannavale) could maintain a record company let alone build one. It's not the fault of this talented actor so much that his character has to trade in drama for showboating. It's as if our interest in Richie is more that he's a lost soul on a bender who needs redemption (a Scorsese trademark) rather than showing us how the industry was transformed by men like him. Vinyl touches on the corruption of rock already written about with verve in Marc Elliott's Rockonomics and Frederic Dannen's Hit Men: Power Brokers and Fast Money Inside the Music Business, but its depiction is used only for touchstones rather than getting into the particulars (as in Richie's betrayal of a talented bluesman). Once again, here, the dilemma of being a critic gets tested. If the laboured excesses of The Wolf of Wall Street were only to be suffered for close to three hours, Vinyl is just three episodes into its first season. I don't have a lot of faith that it will improve, but with television you never know. Maybe once they're done with all that cocaine, Vinyl might find its groove, but for now, it's only locked in one.